Helloooo out there! It's Friday! 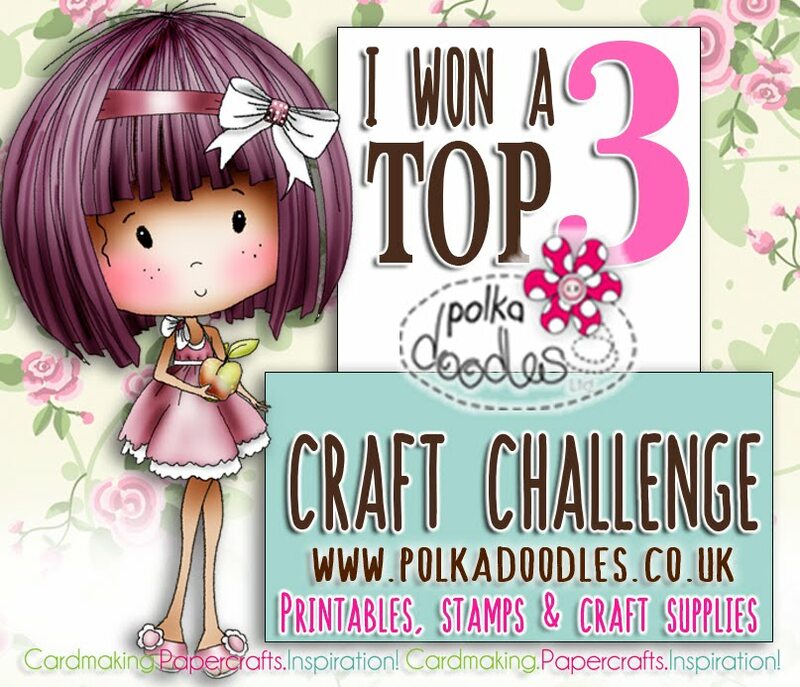 Yay, the weekend is here and I hope you all get time to craft and enter our fabulous challenges. awesome creations to share with you. 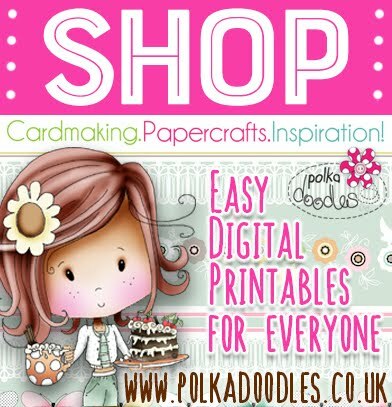 With a plethora of amazing digis, papers, embellishments, cut files. The winners of our Tic-Tac-Toe Challenge will be announced at the end of this post. We would like you to choose a project made either by yourself, or by someone else (the Design Team are happy for you to choose ours but of course you can case anyone you like so long as you have permission! )....the whole idea of this is to then use that project to create your own version, using it as inspiration (not copying!). It could be the colours, the design, the embellishment or die they used, the stamp, the layout, whatever it is you love about that make. You have until 12 noon, GMT, Friday 30 January to enter. 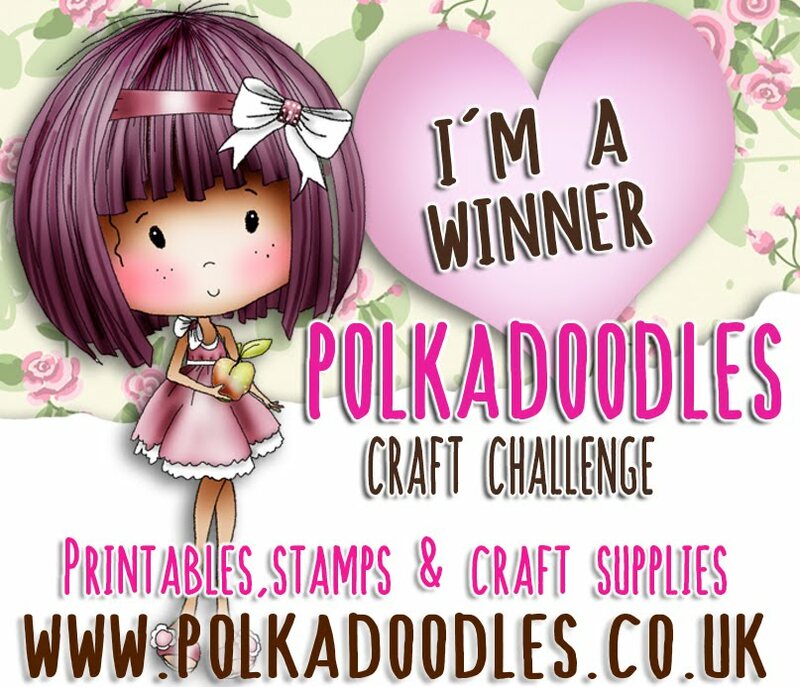 You don't have to use Polkadoodles products to enter our challenges. The random winner of this challenge will receive a copy of our Work & Play 8 collection on download! Wow! 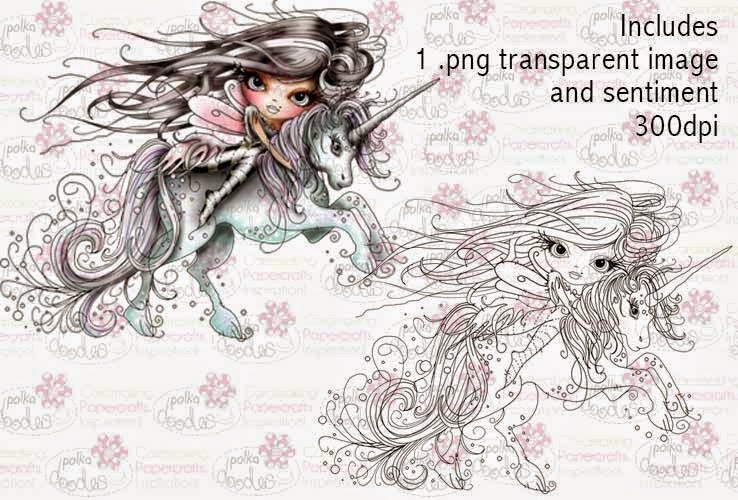 And our top 3 Design Team favourites will all win a digi too! Ruth: I've CASE'd Susan from back in August - the original post is here. I've used the female horse rider from Work and Play 6 and coloured them with Promarkers. The fence and grass are Sizzix die cuts and I made the rosette myself - numbers are Cuttlebug die cuts. Ria: The card I case'd is from Anjie and you can find it here... For my card I used Maddy Shy and coloured her with Copic and Spectrum Noir markers and enhanced with pencils.The papers that I used are from the Work and Play 1 collection. 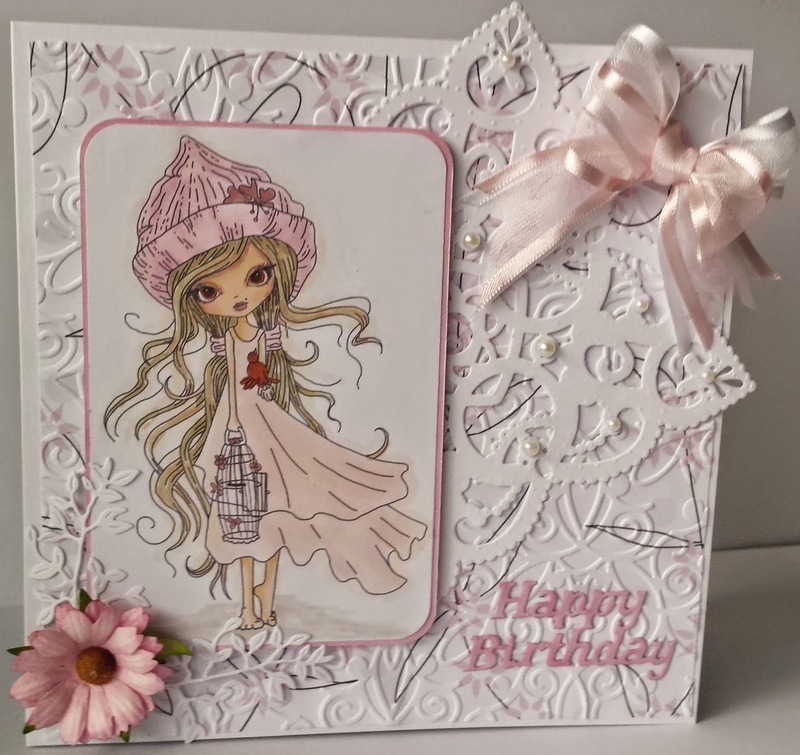 The dies that I used are the watercan and Happy Birthday sentiment dies by Tattered Lace. I have used Work and play collection 2 backing papers and gamer boy and he is also available as a digi image here, I coloured him using alcohol markers and I had a lot of fun and this is my make..
Anjie - I have chosen to CASE a card from the week 47 challenge HERE which was CAS. Now I love all the cards of course but 2 in particular stood out for me, I couldn't get it down to one as they are both very similar and both fab. The cards are by our lovely ladies Bev and Yvonne, and here is my take on it. I have used the fabby Phone/Texter guy image. He is also available on the Work & Play collection 7 which is available as a download or a CD. He of course is coloured with my Graph'It Markers. 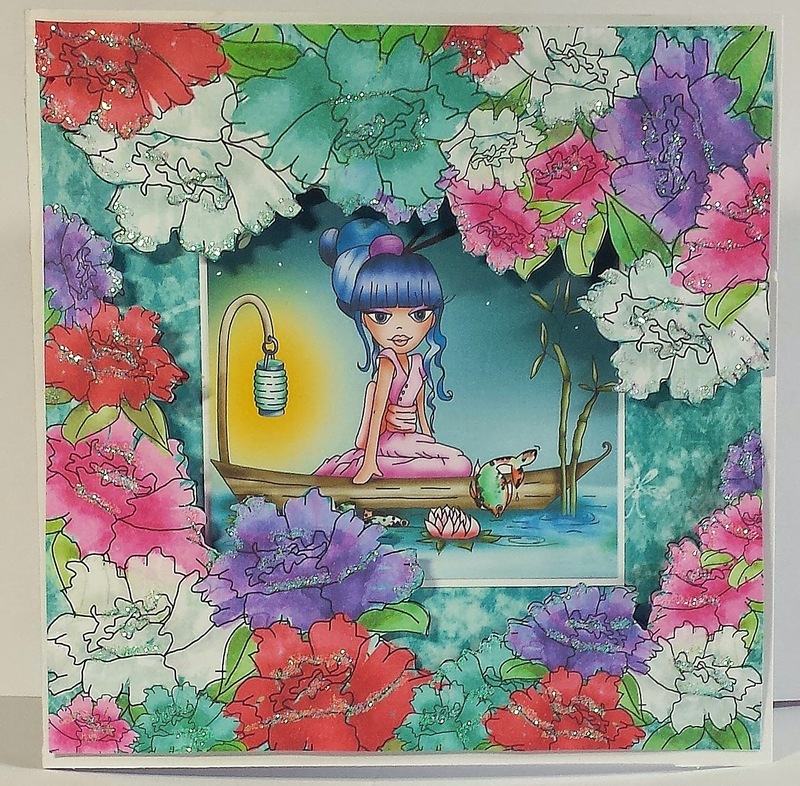 Yvonne - Hi everyone, well once I realised I wasn't making a case, I really liked this challenge!! I kept coming back to a make that the lovely Lou made in our 'Tag You're It' Challenge. You can see the original masterpiece here. 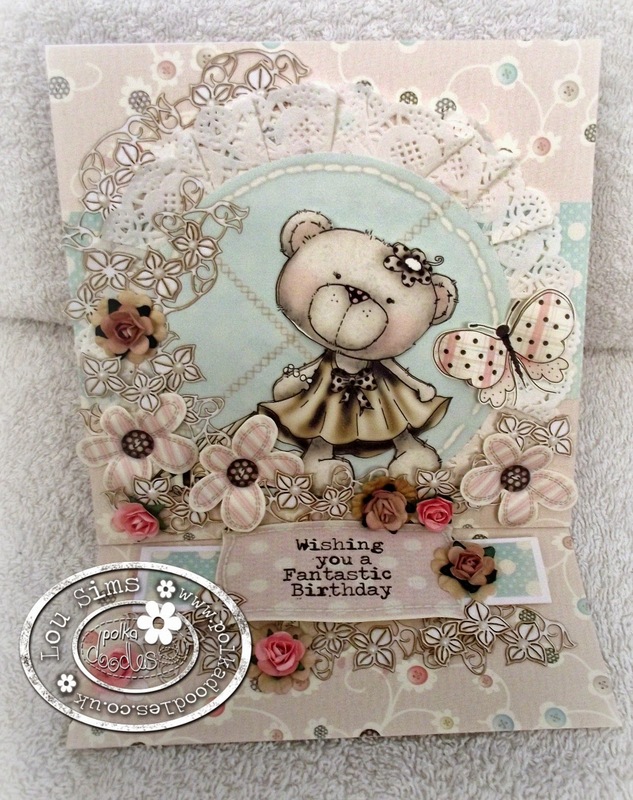 It is the most lovely delicate tag made using embellies and stuff from the gorgeous 'Winston Bear Collection'. 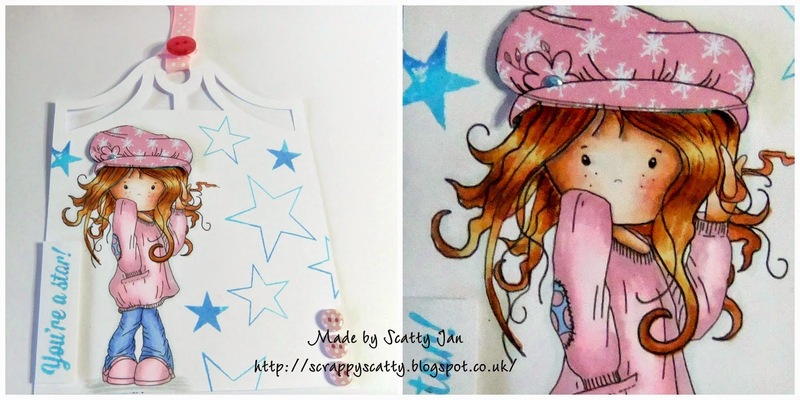 I made quite a large tag but I opted to put 'Etty Sewing' precoloured off of the Collection, however, you can also get her here as a digi image. So I opted to use Etty and then I printed and cut heaps of the embellies, as Lou did but mostly different embellies and added them to the tag! The paper is also from the collection. All that I had to add was the lace and the gems. Bev here and for this weeks challenge I climbed inside Cheremane's head ('Anything But Square' challenge back in October) I tried to leave it as I found it.... I loved this challenge as I've been struggling with my mojo since Christmas so putting my spin on an existing project was a great help and has helped ease me back in. I used the Guitar Girl image from the incredible new W&P 8 collection she's also available as a digi HERE. 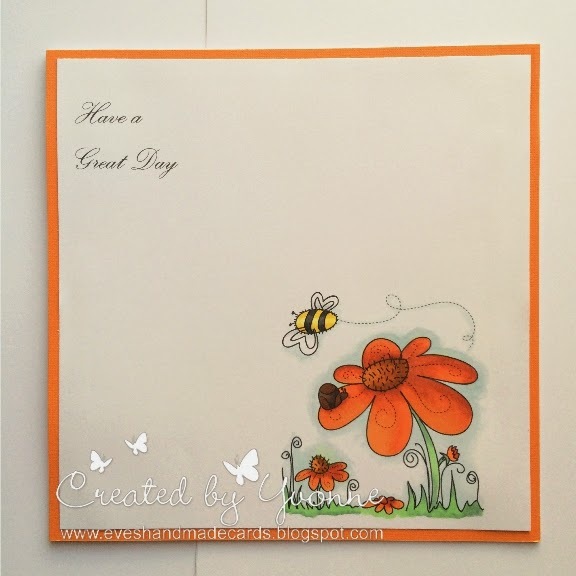 I coloured her with my Graph'it Markers (full details on my blog). 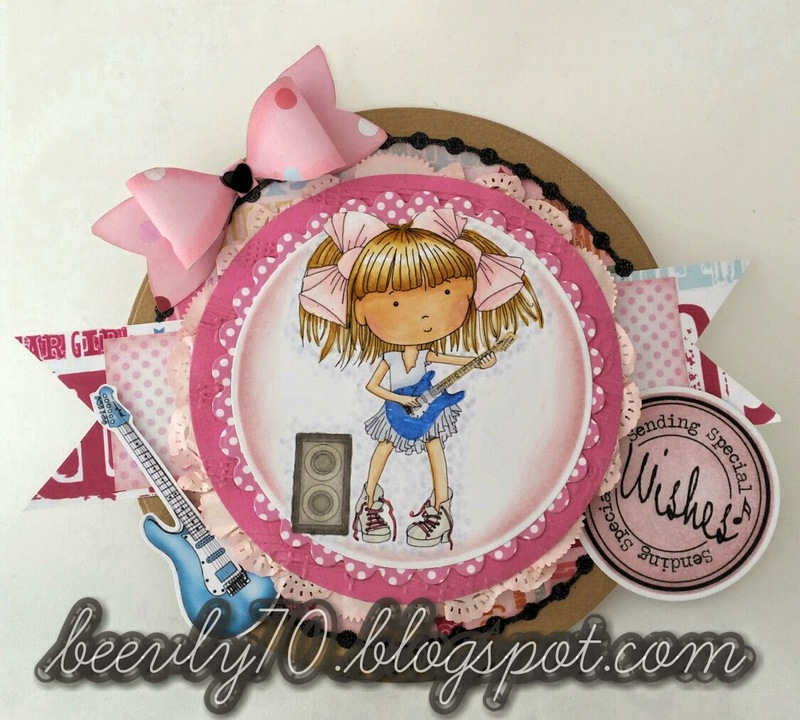 The card base is just cut from Kraft card all the backing paper, bow, embellies and sentiment are from the CD . 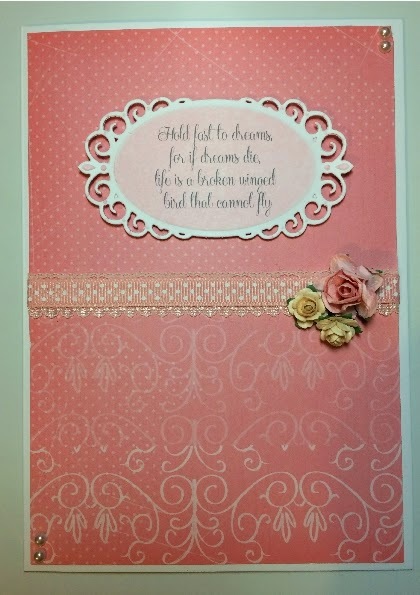 All I've added from my own crafty stash is embossed pink card. a black glittery peel off, distress ink and a gem. Jenny here, for my case it card I've used a card made by Lou way back in May last year. 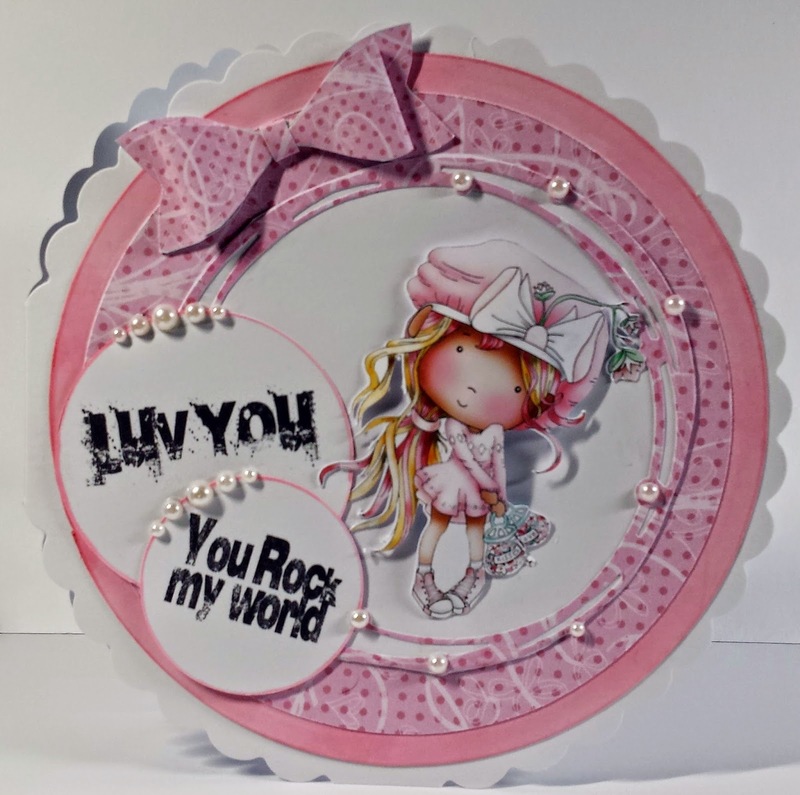 She made a circular card with circular embellishments and that is what I've used for my inspiration. I have used the brand new collection W&P9 Love and Kisses it's a great collection and so easy to use. Claire C - I've taken my inspiration from Lou's hoover card for our Anything but square challenge in October (you can find it here). 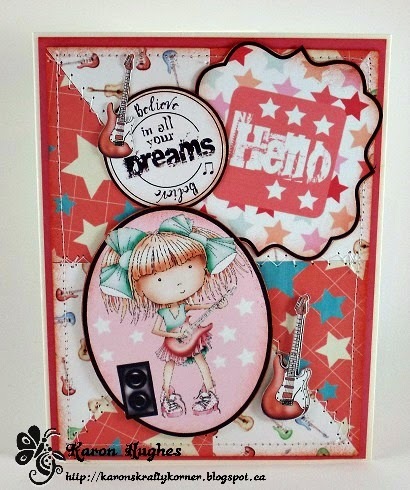 I loved the way Lou had used household stuff to embellish her card and I also loved the idea using the embellishments on the CD as a base card, its so easy to do as you just enlarge the size of the image ! 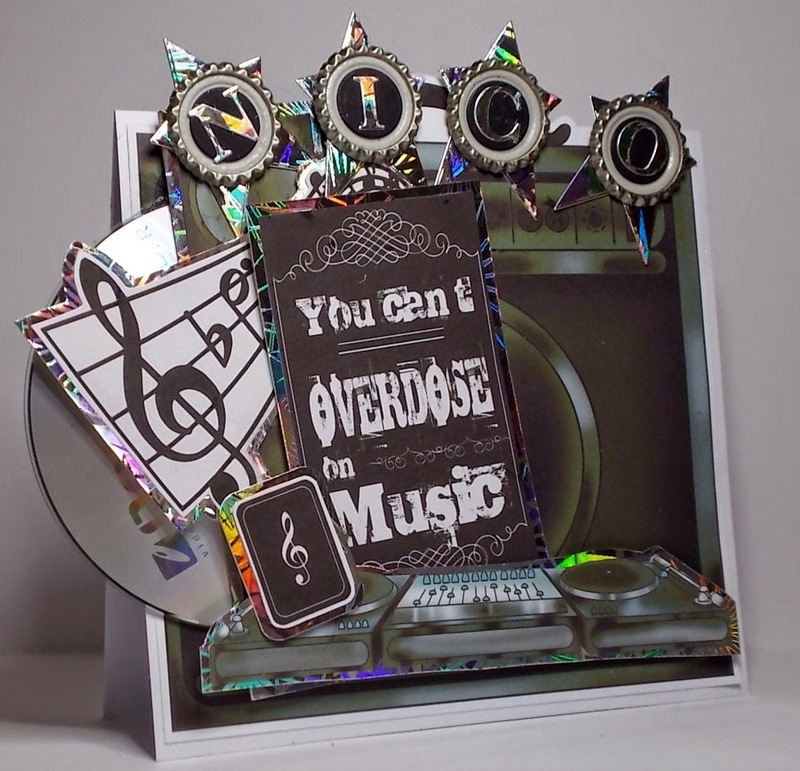 I've used images from Work and Play 8 to make this card and added an old CD and some bottletops to embellish the card. Aren't they just amazing! Love all the fabulous interpretations this week. Please contact us here and quote PD4001wk1 to claim your prize. You have won a full Work and Play collection of your choice, worth over £10! Please make sure you all take your blinkies from the side bar. Congratulations to everyone. Now it's over to you. Our CASE IT challenge is open until Friday, Noon GMT, 30 January. We hope you have all had a fabulous week. Firstly, have you all seen the next new release. Well, why not?! LOL! I think Nikky didn't take much time off over Christmas, as this is the second new release this year! This collection is an XXL collection meaning you get 16, yes 16!! different digistamps included, in addition to the masses of other stuff too! wow! collection, 16 yep 16 character digis, we can't believe it!! 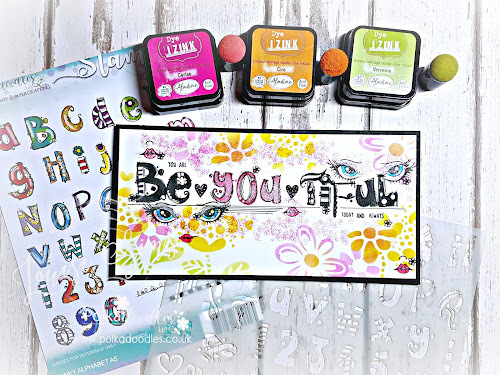 Amazing papers, design sheets, embellishments. This stunning collection has it all! Asha - I'm channelling my inner Anjie with this card made entirely from a design sheet from the über adorable Winston CD. It had all I needed to complete the project. And I also tried my hand at decoupage - a technique I've never attempted before. My CASE inspiration made it's debut in September last year PD challenge #39. I finished my project with some blue ribbon and few droppings of liquid pearls. Karon - I decided to case one of Asha's makes from August last year - you can find it here. 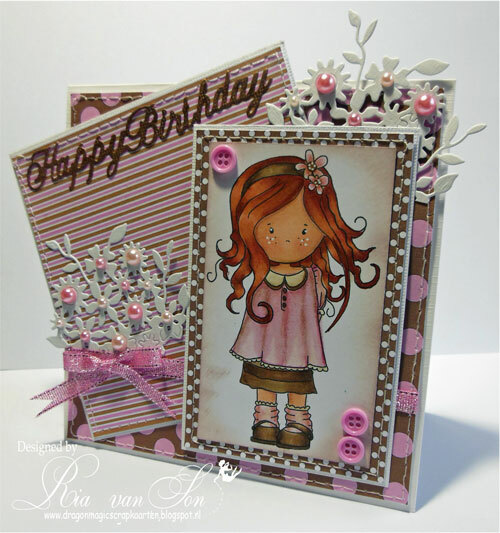 I love the stitching that she always adds to her cards - and loved making the pinwheel background. 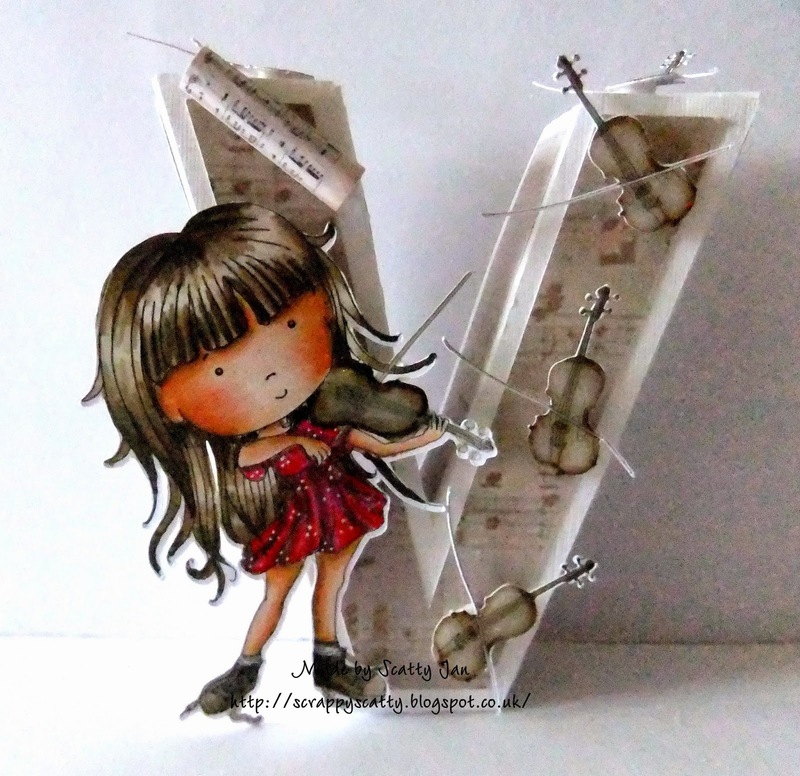 All the elements for my card are from the fabulous new Work and Play 8 - Music CD. Lou: I have cased Anna's beautiful heart card (found here) as it was just the inspiration I needed to make an anniversary card. 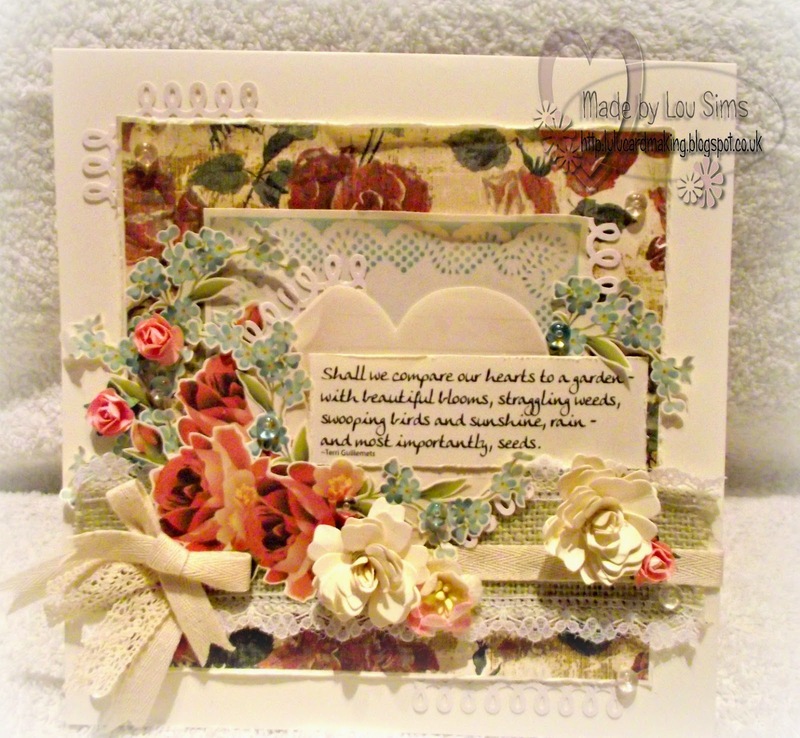 I have used the Picknix Collection; specifically the "In the Garden" kit. Full details can be found on my blog. Cheremane - Seeing its so cold outside I looked to Scatty Jan to CASE as she made a fab pop up card back in August when it was nice and warm. I've used the fabulous Work & Play 8 Cd - Music you can also get the Characters as single Digi's which is fab. 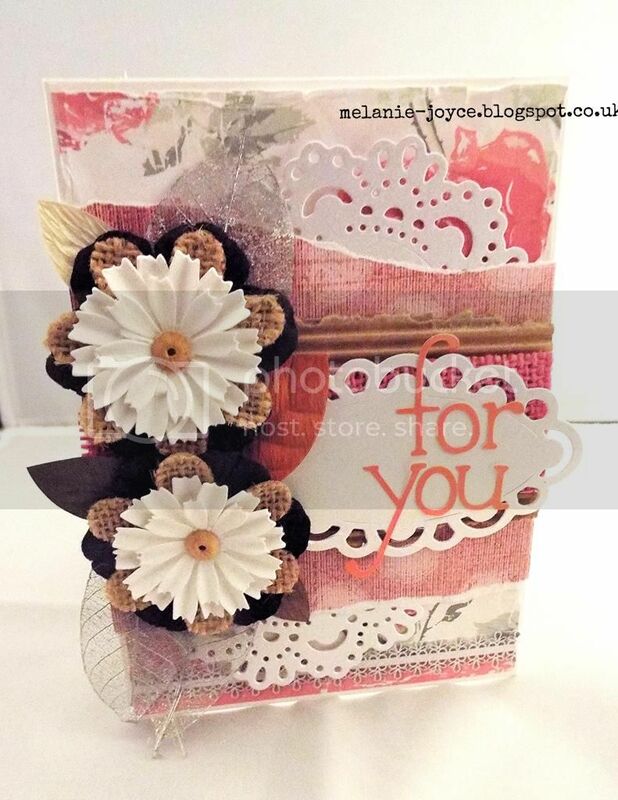 Melanie - I've cased the lovely Anna for this card, I adore her layered style and gorgeous attention to detail. 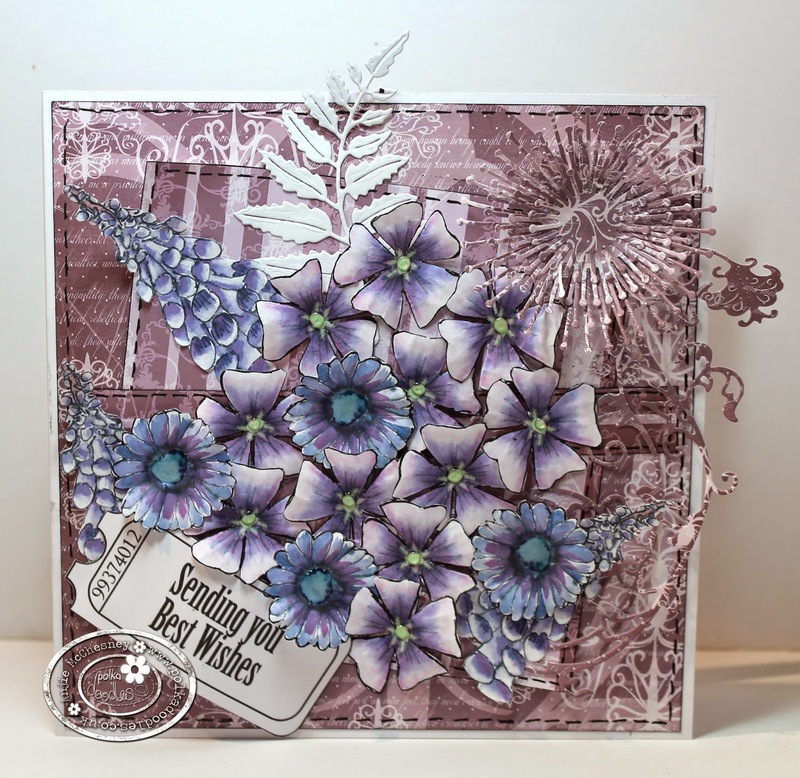 I tried to emulate the layout of her lovely make for the recycling challenge back in November, which used the Rose Budd collection in frosty tones of blue and lilac. 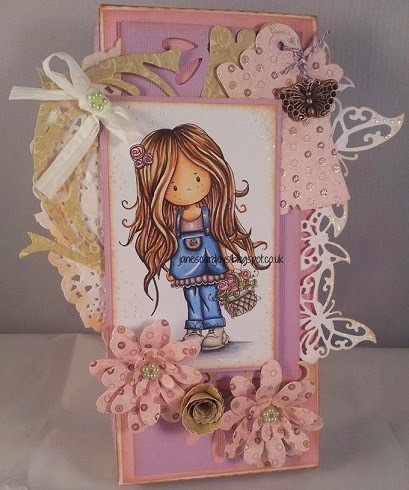 For this card I went for a more springtime look and feel, using papers from the Picknix collection. I really enjoyed making it! Don't forget to go take a peek at their teamies cards to see where they got their inspiration from. Our Tic Tac Toe challenge winners will be announced next Friday. 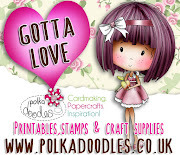 So, have a look at some past creations on Polkadoodles and get into your craft rooms. Please remember that there are a maximum of 2 entries per person. Hi everyone. How has your first week of the New Year gone? We are all busy here with a new release and also some new members of the Design Team to introduce to you. Work and Play 8 - Music. for you to get your teeth into. It is available as a CD and also as an immediate download collection. I am sure you will make them feel really welcome! 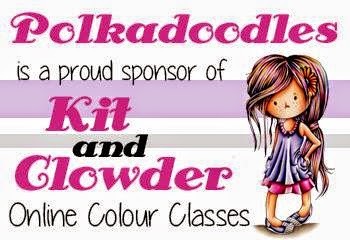 They are a great addition to our team and if you click on their names you can take a visit to their fabulous blogs. Jane was so excited to be joining us, that she created this fabulous card as a big hello to the team and to all of you out there. Isn't it gorgeous. She has used the fabulous Piper with Bunches digi. Christmas Reds and Blues will be announced at the end of this post. Now onto this weeks fabulous inspiration from our Design Team. To enter the challenge you can go HERE! 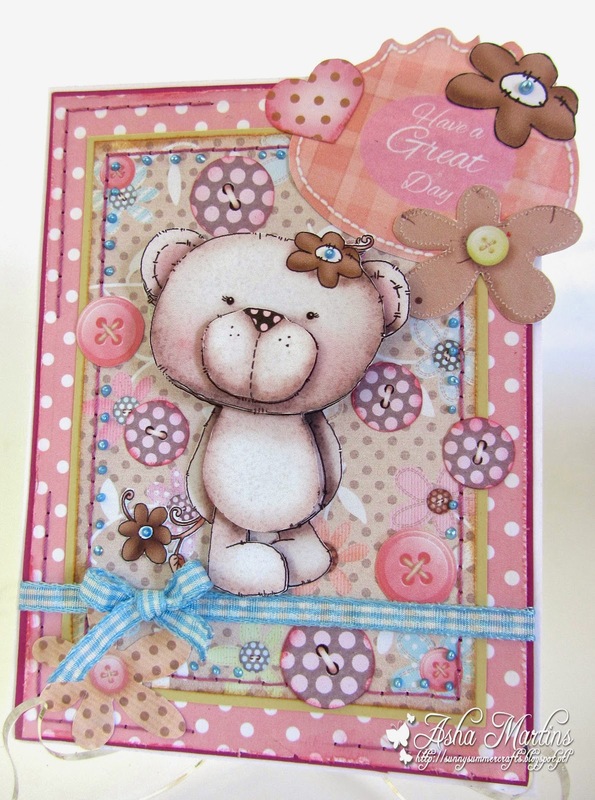 Ruth: I've gone for something simple and used the bottom row - Embossing, Buttons and Polka Dots. I found some laser cut hearts (perfect for Valentine's Day!) in my stash when having a tidy up and teamed it with some hot red polka dot paper from Work and Play 5 - Festive Hollybobs. Everything else is from my stash. 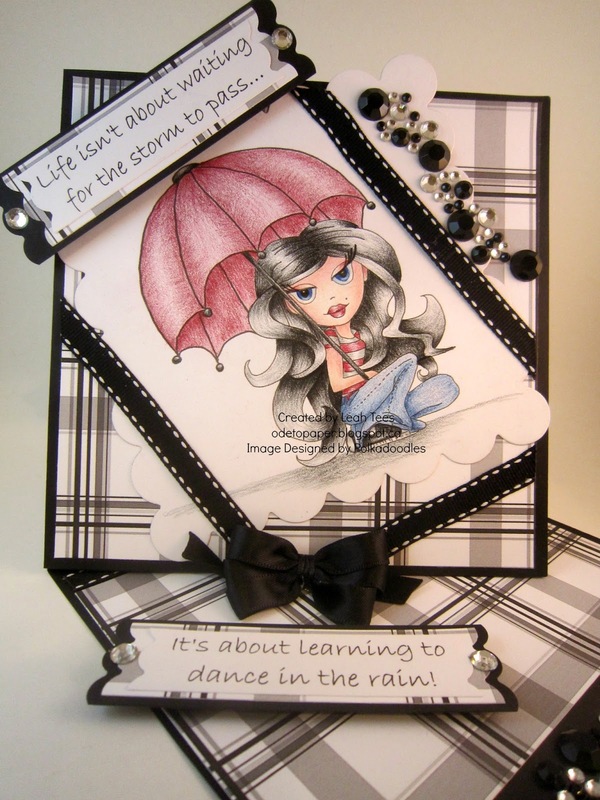 Karon - I decided to use the diagonal for my card - Sentiment, Ribbon, Polka dots. 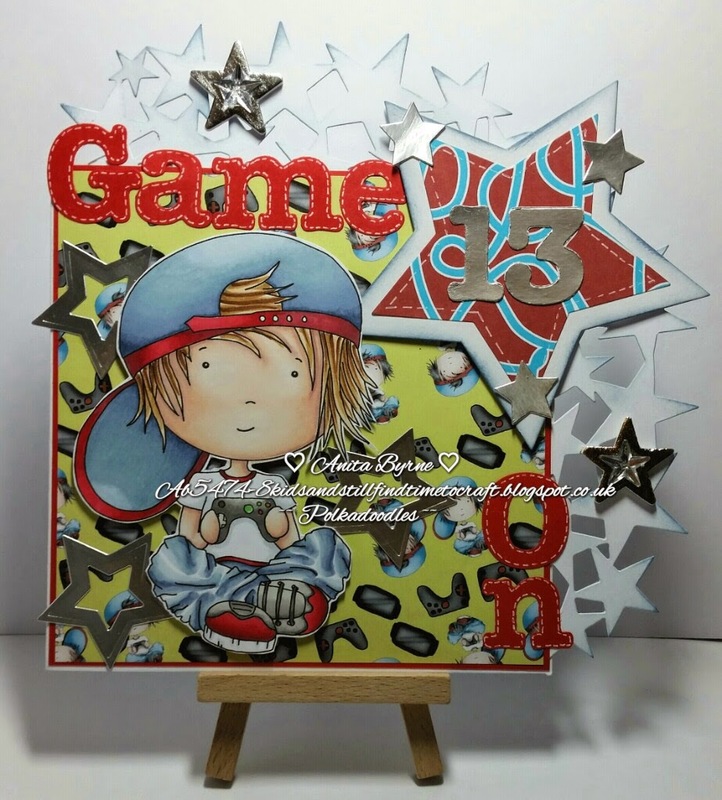 I used the fabulous Work and Play 7 Collection for this card and just inked around the edges. 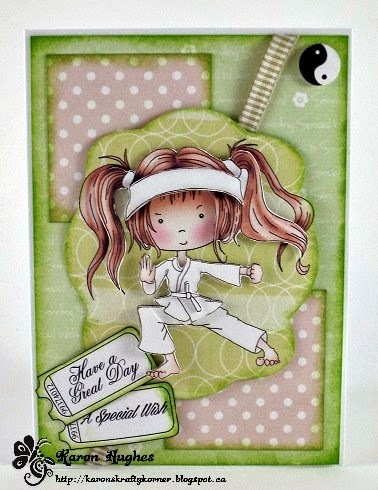 This karate girl is is from one of the design sheets and is a pre-coloured digi. Asha - I made a Valentines's card for my young nieces using the image from the Sugar Birdies CD and sweet button paper from the Bonbon Belles Double CD. I've also thrown in the following: polka dot ribbon, dotted flower, diecut hearts, embossed heart, buttons and stitching. 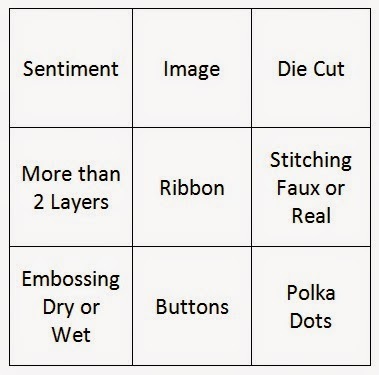 My design follows the right column (Diecut - Stitching - Polka Dots) or the middle column (Image - Ribbon - Buttons) or the bottom row ( Embossing - Buttons - Polka Dots) or the middle row (More Than 2 Layers - Ribbon - Stitching) or the bottom left to top right diagonal (Embossing - Ribbon - Diecut). Decisions ... decisions! 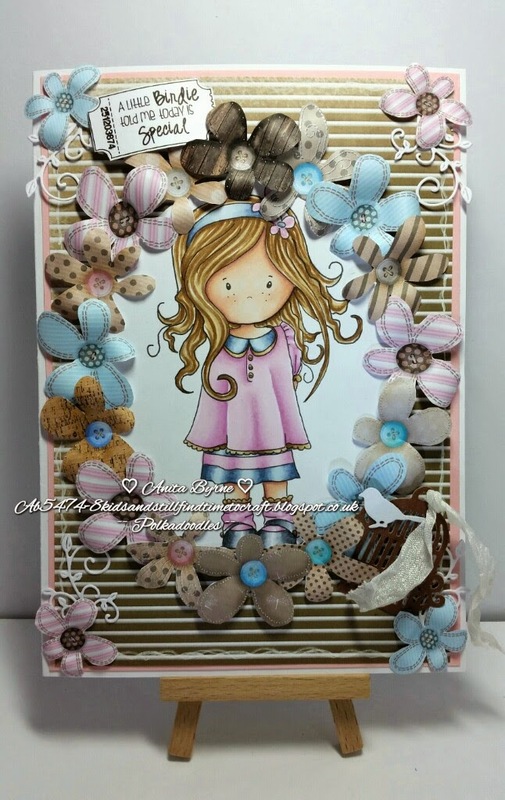 Jane - Really couldn't wait to get started as a new Design Team member and therefore here is my creation for this latest challenge. 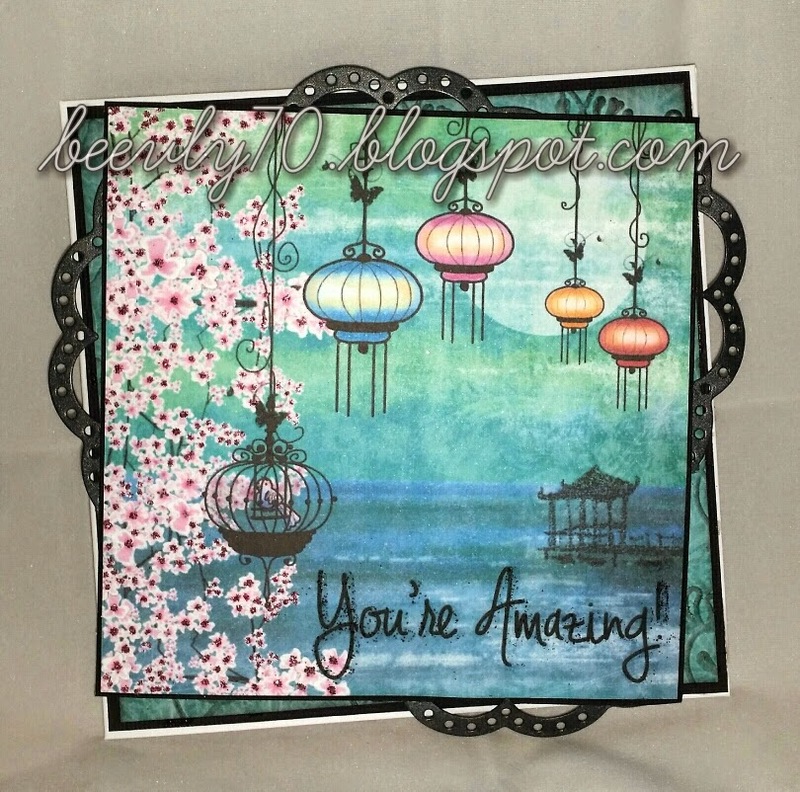 I used the wonderful Amelia with Basket digi. 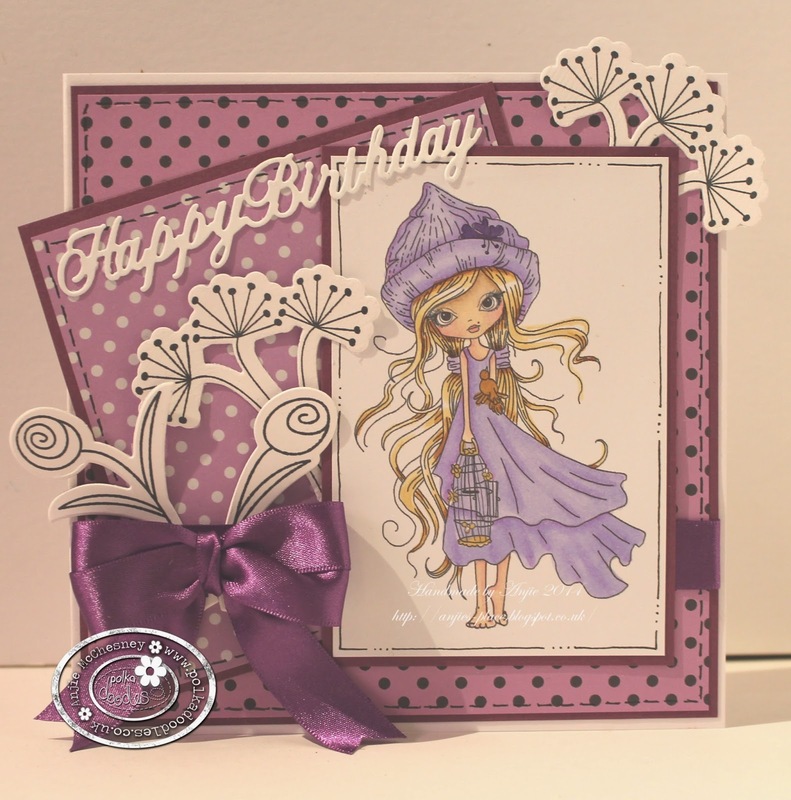 Anna - This time I made a card in shades of violet for a Name Day, which as it turns out, is celebrated only in Poland. 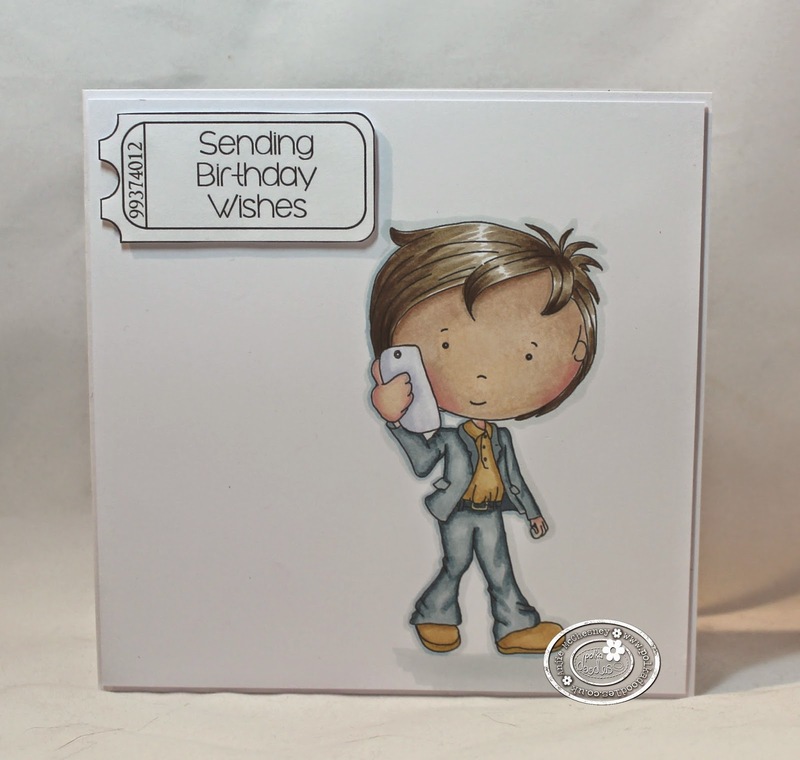 I prepared the card with paper from the Winston Deluxe Papercrafting Collection , using left row : Sentiment, More than 2 layers, Embossing or the bottom left to top right diagonal row : Embossing, Ribbon, Die cut, or the bottom row : Embossing, Buttons, Polka Dots. 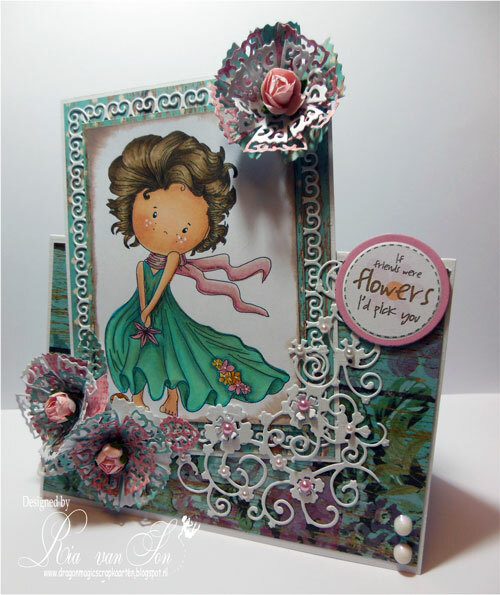 A layered card with die cut accessories, flowers and a string of pearls. 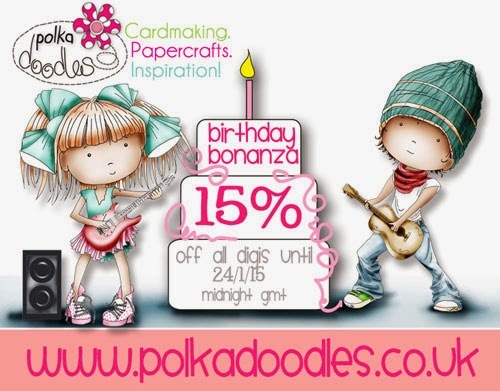 Lou: I think I may have used more than one line when making my card ... well I just needed to make sure ...! I have used the line "sentiment, more than 2 layers, embossing". 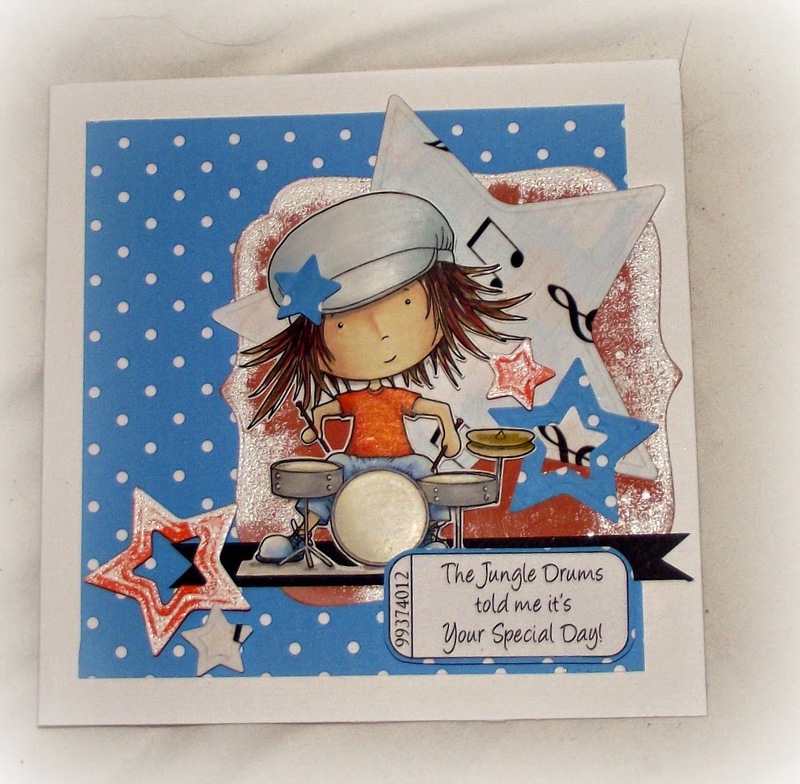 I have used Drummer Troy clear rubber stamp (now sold out) on my card, although he is available as a digi download and also can be found on the Work and Play 1 CD. Brand New W&P 8 Collection over at the Shop. The Design Team had great pleasure in visiting you all and have chosen a Top 3 for this challenge. You are all winners and have won a Work & Play download bundle worth £5 each. Please contact us here and quote PD2001wk51 to claim your prize. You have until 12 noon, GMT, Friday 16 January to enter.